She was raised a Roman Catholic, is a qualified pilot and graduated in marine biology with a doctorate specialisation in squids and oysters. Now Katharine Jefferts Schori has become the first female head of an Anglican denomination anywhere in the world. The 52-year-old Bishop of Nevada narrowly beat six candidates to become head of the US Episcopal Church in a move already causing concern among traditionalists in Anglican denominations around the world. Apart from the US, only Canada and New Zealand, among 38 Anglican provinces, have female bishops, although others do allow for their appointment. Bishop Jefferts Schori responded to the threat of opposition by recalling similar difficulties in her earlier marine biology days. She said the captain of a science research cruise she was on had initially pledged not to speak to her but after 15 minutes on board "he got over it". "I will bend over backward to build relationships with people who disagree with me," she said. Katharine Jefferts Schori graduated in biology at Stanford University before taking a master's and doctorate in oceanography at Oregon State. She worked with the National Marine Fisheries Service but after funding for her work dried up, was ordained as a priest in 1994 and filled in as a preacher in a local church. She said the preaching "led me to realise it was something I wanted to do". 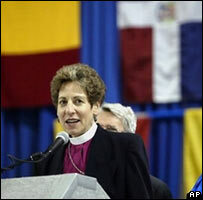 She rose to bishop and leader of the Nevada diocese in 2001. Married with one daughter, Bishop Jefferts Schori is fluent in Spanish and is known for reaching out to the Hispanic community. She is also a liberal, having voted three years ago for the ordination of gay US bishop Gene Robinson, a move that sparked fury in some other Anglican denominations, particularly in Africa. As Church leader, one of her challenges will be to try to heal such divisions.